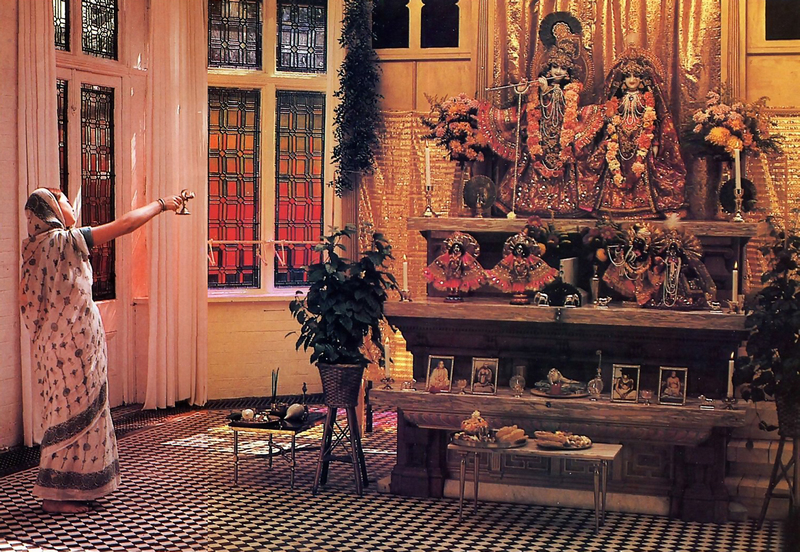 A lecture by His Divine Grace A.C. Bhaktivedanta Swami Prabhupada. Worship of the Lord’s Deity form in the temple is an essential part of bhakti, the yoga of devotion. Here, in an ancient Vedic ceremony called arati, a devotee offers a camphor lamp to the Deities of Lord Krsna and His eternal consort. Srimati Radharani, who grace the altar at the Bhaktivedanta Manor near London. The word yoga has become synonymous in Western vernacular with a lithe figure, radiant health, peace of mind, and other material benefits. But the original meaning of the Sanskrit term carries a different, higher import: linking with the Supreme. In this lecture from 1968, Srila Prabhupada distinguishes the true goal of yoga—loving devotion to the Supreme Lord—from the physical and psychological elements of yoga practice. Since Krsna is speaking, the words in Me mean “in Krsna.” In other words, if one wants to become a perfect yogi on the highest platform, one should keep oneself in Krsna consciousness. In this regard, the word bhajate in this verse is significant. Bhajate has its root in the verb bhaj, which is used to indicate devotional service. The English word worship cannot be used in the same sense as bhaja. To worship means “to adore” or “to show respect and honor to a worthy one.” But service with love and faith is especially meant for the Supreme Personality of Godhead. One can avoid worshiping a respectable man or a demigod and be called merely discourteous, but one cannot avoid serving the Supreme Lord without being thoroughly condemned. Thus when we speak of worship, there is a selfish motive, but when we speak of devotional service, there is no motive except the desire to please the beloved. Devotional service is based on love. For example, when a mother renders service to her child, there is no personal motive; she serves only out of love. Everyone else may neglect the child, but the mother cannot, because she loves him. Similarly, when there is a question of service to God, there should be no question of a personal motive. That is perfect Krsna consciousness, and that is recommended in Srimad Bhagavatam [1.2.6] in the description of the first-class system of religious principles: sa vai pumsam paro dharmo yato bhaktir adhoksaje—“The first-class system of religious principles is that which enables one to develop one’s God conciousness, or love of God.” If one can develop one’s love for God, one may follow any religious principle—it doesn’t matter. But the test is how much one is developing one’s love for God. But if one has some personal motive and thinks, “By practicing this system of religion, my material necessities will be fulfilled,” that is not first-class religion. That is third-class religion. First-class religion is that by which one can develop one’s love for God, and that love must be without any personal motive and without any impediment (ahaituky apratihata). That is first-class religion, a recommended here by Krsna in this final verse of the Sixth Chapter of Bhagavad-gita. We should simply try to love God, without demanding anything. Our needs will be supplied. Even the cats and dogs are getting their necessities. They don’t go to church and ask God for anything, but they are getting their necessities. So why should a devotee not get his necessities? If the cats and dogs can get their necessities of life without demanding anything from God, why should we demand from God, “Give me this, give me that”? No. We should simply try to love Him and serve Him. That will fulfill everything, and that is the highest platform of yoga. Service to God is natural; since I am part and parcel of God, my natural duty is to serve Him. The example of the finger and the body is appropriate. The finger is part and parcel of the body. And what is the duty of the finger? To serve the whole body, that’s all. If you are feeling some itch, immediately your finger is working. If you want to see, your eyes immediately work. If you want to go somewhere, your legs immediately take you there. So, the bodily parts and limbs are helping the whole body. Similarly, we are all part and parcel of God, and we are all meant simply for rendering service to Him. When the limbs of the body serve the whole body, the energy automatically comes to the limbs. Similarly, when we serve Krsna, we get all our necessities automatically. Yatha taror mula-nisecanena. If one pours water on the root of a tree, the energy is immediately supplied to the leaves, the twigs, the branches, and so on. Similarly, simply by serving Krsna, or God, we serve all other parts of creation. There is no question of serving each living entity separately. Another point is that by serving God, we will automatically have sympathy for all living beings—not only for human beings, but even for animals. Therefore God consciousness, Krsna consciousness, is the perfection of religion. Without Krsna consciousness our sympathy for other living entities is very limited, but with Krsna consciousness our sympathy for other living entities is full. How do we fall down from our constitutional position? Once again, the example of the finger and the body is appropriate. If one’s finger becomes diseased and cannot render service to the whole body, it simply gives one pain. Similarly, any person who is not rendering service to the Supreme Lord is simply disturbing Him, giving Him pain and trouble. Therefore, such a person has to suffer, just like a man who is not abiding by the laws of the state. Such a criminal simply gives pain to the government, and he’s liable to be punished. He may think, “I’m a very good man,” but because he’s violating the laws of the state, he’s simply torturing the government. This is easy to understand. So, any living entity who is not serving Krsna is causing Him a kind of pain. And that is sinful—to make Krsna feel pain. Just as the government collects all the painful citizens and keeps them in the prison house—”You criminals must live here so you can’t disturb people in the open state”—so God puts all the criminals who have violated His laws, who have simply given Him pain, into this material world. Sthanad bhrastah patanty adhah: they fall down from their constitutional position in the spiritual world. Again we may cite the example of the finger. If your finger is extremely painful, the doctor may advise, “Mr. So-and-so, your finger has to be amputated. Otherwise, it will pollute your whole body.” Sthanad bhrastah patanty adhah: the finger then falls down from its constitutional position as part of the body. Having rebelled against the principles of God consciousness, we have all fallen down to this material world. If we want to revive our original position, we must again establish ourselves in the service attitude. That is the perfect cure. Otherwise, we shall suffer pain, and God will be suffering pain on account of us. We are just like bad sons of God. If a son is not good. he suffers, and the father suffers along with the son. Similarly, when we are suffering, God is also suffering. 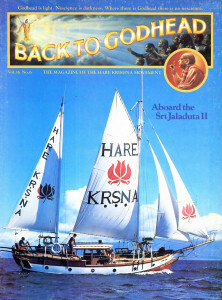 Therefore, the best thing is to revive our original Krsna consciousness and engage in the service of the Lord. “Fools deride Me when I descend in the human form. They do not know My transcendental nature and Mv supreme dominion over all that be.” Only the fools and rascals deride the Supreme Personality of Godhead, Lord Krsna. The word mudha means “fool” or “rascal.” Only a rascal does not care for Krsna. Not knowing that he will suffer for this attitude, he dares neglect Him. Without knowing the supreme position of the Lord, the rascals worship some cheap “God.” God has become so cheap that many people say, “I am God, you are God.” But what is the meaning of the word God” If everyone is God, then what is the meaning of God? So, the word avajananti is very appropriate. Avajananti means “neglectful,” and it perfectly describes the person who says, “What is God? I am God. Why should I serve God?” This is avajananti—neglecting God’s real position. A criminal may have the same attitude toward the government-: “Oh, what is the government? I can do whatever I like. I don’t care for the government.” This is avajananti. But even if we say, “I don’t care for the government,” the police department is there. It will give us pain; it will punish us. Similarly, even if we don’t care for God, the material nature will punish us with birth, old age, disease, and death. To get out of this suffering, we must take to the practice of yoga. The culmination of all kinds of yoga practice lies in bhakti-yoga. All other yogas are but means to come to the point of bhakti-yoga. Yoga actually means bhakti-yoga; all other yogas are progressions toward this destination. From the beginning of karma-yoga to the end of bhakti-yoga is a long way to self-realization. Karma-yoga, executed without fruitive desires, is the beginning of this path. (Fruitive activities, or karma, include sinful activities also. But karma-yoga does not include sinful activities but only good, pious activities, or prescribed activities. This is karma-yoga.) Then, when karma-yoga increases in knowledge and renunciation, the stage is called jnana-yoga. When jnana-yoga increases in meditation on the Supersoul by various physical processes, and when the mind is on Him, one has reached the stage called astanga-yoga. And when one surpasses astanga-yoga and comes to the point of serving the Supreme Personality of Godhead, Krsna, one has reached bhakti-yoga, the culmination. Factually, bhakti-yoga is the ultimate goal, but to analyze bhakti-yoga minutely one has to understand these other, minor yogas. The yogi who is progressive is therefore on the true path of eternal auspi-ciousness, whereas one who sticks to a particular point and does not make further progress is called by that particular name: karma-yogi, jnana-yogi, or astanga-yogi. But if one is fortunate enough to come to the point of bhakti-yoga, it is to be understood that one has surpassed all the other yogas. Therefore, to become Krsna conscious is the highest stage of yoga, just as, ‘when we speak of the Himalayas, we refer to the world’s highest mountains, of which the highest peak, Mount Everest, is considered the culmination. If someone practicing jnana-yoga thinks that he is finished, that is wrong. He has to make further progress. For example, suppose you want to go the highest floor of a building—say, the hundredth floor—by walking up a staircase. You will pass the thirtieth floor, the fiftieth floor, the eightieth floor, and so on. But suppose when you come to the fiftieth or eightieth floor you think, “I have reached my goal.” Then you are unsuccessful. To reach your destination you have to go to the hundredth floor. Similarly, all the processes of yoga are connected like a staircase, but we shouldn’t be satisfied to stop on the fiftieth floor or the eightieth floor. We should go to the highest platform, the hundredth floor—pure Krsna consciousness. Now, if somebody who wants to reach the hundredth floor is given a chance to use the elevator, within a minute he will be able to come to the top. Of course, he may still say, “Why should 1 take advantage of this elevator? 1 shall go step by step.” He can do this, but there is a chance he will not reach the top floor. Similarly, if one takes help from the “elevator” of bhakti-yoga, within a short time he can reach the “hundredth floor”—the perfection of yoga, Krsna consciousness. Krsna consciousness is the direct process. You may go step by step, following all the other yoga systems, or you may may take directly to Krsna consciousness. Lord Caitanya has recommended that in this age, since people are very short-lived, disturbed, and full of anxiety, they should take up the direct process. And by His grace, by His causeless mercy, He has given us the chanting of the Hare Krsna mantra, which lifts us immediately to the platform of bhakti-yoga. It is immediate; we don’t have to wait. That is the special gift of Lord Caitanya. Therefore Srila Rupa Gosvami prayed, namo maha-vadanyaya krsna-prema-pradaya te: “O Lord Caitanya, You are the most munificent incarnation because You are directly giving love of Krsna.” Ordinarily, to attain love for Krsna one has to pass through so many steps and stages of yoga, but Lord Caitanya gave it directly. Therefore He is most munificent incarnation. This is the position of Lord Caitanva. The only way to know God in truth is through bhakti-yoga. In Bhagavad-gita [18.55] Krsna confirms this. Bhaktya abhijanati yavan yas casmi tattvatah: “Only by devotional service can one understand the Supreme Personality of Godhead as He is ” The Vedas confirm that only through bhakti, or devotional service, can one attain the highest perfectional stage. If one practices other yoga systems, there must be a mixture of bhakti if one is to make progress. But because people don’t have sufficient time to execute all the practices of any other yoga system, the direct process of bhakti-yoga, unadulterated devotion, is recommended for this age. Therefore, it is by great fortune that one comes to Krsna consciousness, the path of bhakti-yoga, and becomes well situated according to the Vedic directions. The ideal yogi concentrates his attention on Krsna, who is as beautifully colored as a cloud, whose lotus like face is as effulgent as the sun, whose dress is brilliant with jewels, and whose body is garlanded. Illuminating all sides is His gorgeous luster, which is called the brahmajyoti. He incarnates in different forms such as Rama, Varaha, and Krsna, the Supreme Personality of Godhead. He descends as a human being—as the son of Mother Yasoda—and He is known as Krsna, Govinda, and Vasudeva. He is the perfect child, husband, friend, and master, and He is full with all opulences and transcendental qualities. One who remains fully conscious of these features of the Lord is the highest yogi. This stage of perfection in yoga can be attained only by bhakti-yoga, as confirmed in all Vedic literature.